It was a close game until mid of the third quarter, but in the last 1 ½ quarters the Swarco Raiders stepped up and made it finally a clear 49:20 victory. 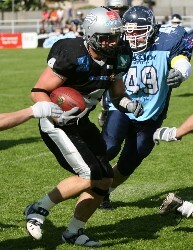 The Swarco Raiders advanced for the fourth time in a row to EFL semi-finals. MVP of the game was once again RB Florian Grein, who ran and received for 162 yards and made 3 TDs.